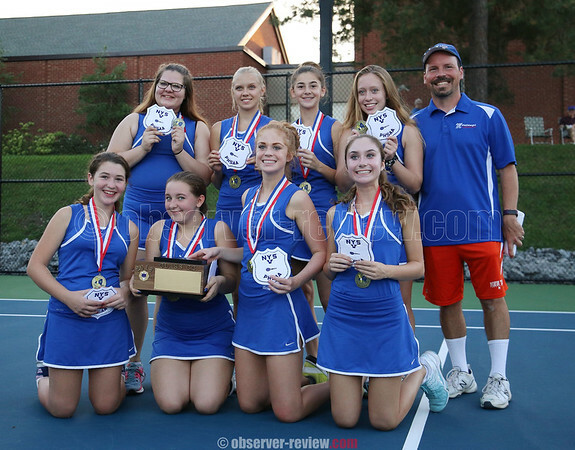 GENEVA--The Penn Yan varsity tennis team won their first-ever sectional title in the Class CC finals against Marcus Whitman, Tuesday, Oct. 9. The win also marks a 15-0 perfect win record for the season. The final score against Marcus Whitman was 5-0. In singles, Molly Pullen defeated Rebecca Frarey, 6-1, 6-0. The score for Claire Pullen against Alaina Dhondt was 6-0, 6-3. Sam Denson beat Caty Goodman, 6-0, 3-6, 6-2. In doubles, Jayden Hollister and Grace Worth topped Camry Semans and Jane Snaith, 6-0, 6-3. Sydney Moravec and Abby Garvey won against Kaitlyn Hopper and Jennifer Roussell, 6-1, 7-5.